Chiefs, dancers, and shamans used rattles that depicted Raven with a reclining human figure on his back. The figure receives spiritual power through the tongue of a bird, or from the tongue of a frog that the bird holds in its beak. The symbolism refers to the way that an ixt’, or shaman, acquired the land otter and other animals as helping spirits by cutting out their tongues. The face of a hawk is carved on Raven’s chest. Raven rattles were widespread among Northwest Coast peoples and are thought to have been first made by the Nisga’a. Delores Churchill: Yes, looks like a transformation, huh? With the human. Clarence Jackson: Yaatáa ku .aa gwál, xixch áyá akwshá? Waanganéens, Ixt du shagooni áyá. Ách’ áyá tlél aadéi jakoogéiyee aax gáxduwashaadee yé. Delores Churchill: Yes, a little frog. It has to be Tlingit then with the raven and the frog I think, unless it’s a story rattle. Donald Gregory: Looks like an oyster catcher on the tail design. Donald Gregory: Yes, that one here on the back. And there’s usually a hawk or something on the belly. Take it out. . . . Oh, it still has the rattle. It still works [shakes it]. Anna Katzeek: Is that a raven rattle? Delores Churchill: Wow, those undercuts are incredible. George Ramos: Sheishóox yéi áhéi duwasáakw akwshá? Clarence Jackson: What’s on the bottom? Donald Gregory: It looks like a hawk. Clarence Jackson: Yes, it is a hawk. Clarence Jackson: Don’t damage the rest. Donald Gregory: It’s easy to take a whole leg off if you slip just a little bit, if your blade is sharp all the way, so they dull the edge of it along the blade. They’re just using the tips to take out the carving. I wonder, before they had western contact, or when they had metal contact I should say, what they used to get in and do that really fine intricate work. And it’s hollow through the head underneath the human and even in the nostril, I mean even in the beak here, it has a hollow all the way through. Clarence Jackson: So it belongs to the Raven? Delores Churchill: Not necessarily. Could be the Raven’s story. 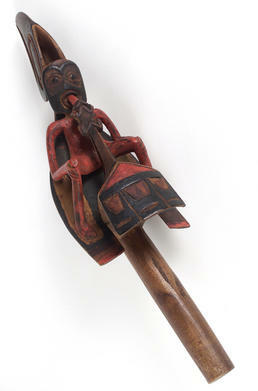 Rosita Worl: The ixt [shaman], no matter if he was Eagle or Raven, he would use the Raven rattle. And it depends—I mean he might have on there the spirits. The spirits are different than your crest. So the spirits that he had, he might have had the frog, and the oyster catcher is also very common with the ixt. They have to go out and get their spirits, and so it really depends. But as far as all the work that I’ve done is that the Raven rattle is used by both Eagle and raven ixt. Aron Crowell: Is it ever used by others as just part of a potlatch? Clarence Jackson: Something that intricately carved probably belongs to a shaman, too intricate. The regular rattles, and I stand corrected, they’re just regular rattles, they’re not that intricate. . . .
Peter Jack: Yaatáa yoo áwé xwa.áxchi núch ixt, du yeegee du daadéi wu.aadee áwé. Waanganéens sáwé, Du tóox yaa ishxíxch’. Aagáa áwé latséen áx jeex ate. Áyá áx tuwáa yatee. Yáa áx tuwáa yatee du yeigee áyá. Du tóox yeinashíx. (This is something I used to hear about a shaman, when his spirit helpers have come upon him. Sometimes now, the spirit helpers run through the shaman. That is where the shaman gains his strength. Clarence Jackson: Do you have anything to add Delores? Delores Churchill: Well I know in the Haida too, the same way that the humanoid is showing the transformation when its tongue goes into the frog but also into the bird, it is showing that there’s a transformation that is used for healing. And this type of rattle was not used for evil, it was used for good. And so I think that’s one thing we have to really emphasize, that this is a healing rattle.